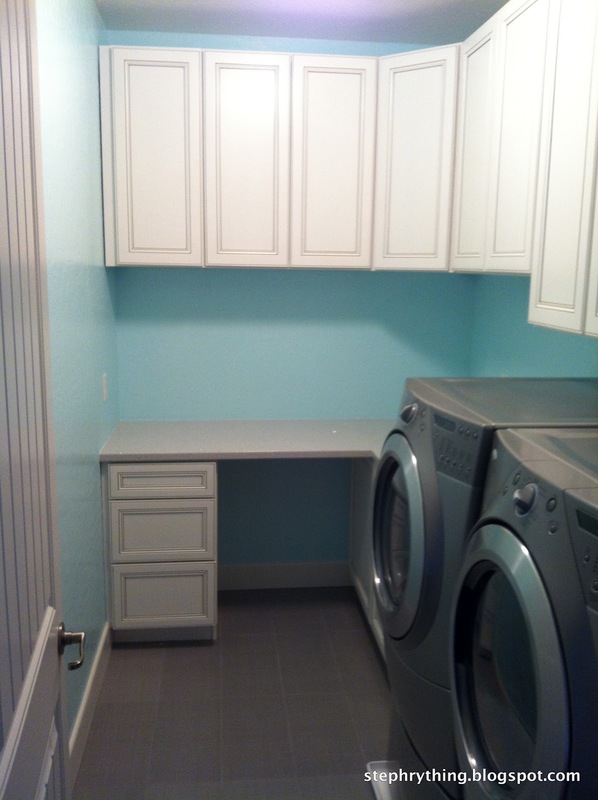 laundry.craft room | . 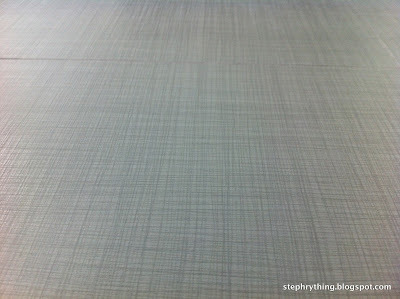 stephrything . My laundry room started out as nothing special. 6' x 10' ... 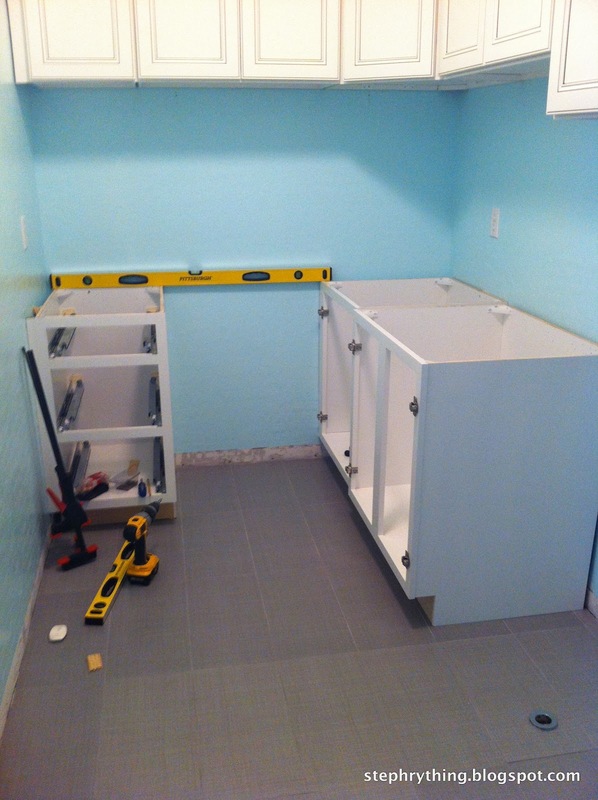 Enough room for a future washer and dryer, and random storage sitting on top of builder-standard linoleum. Don't forget the lovely MDF shelf. That's a standard feature, too. We started the sprucing up by painting it Behr Spa. Ahhh. 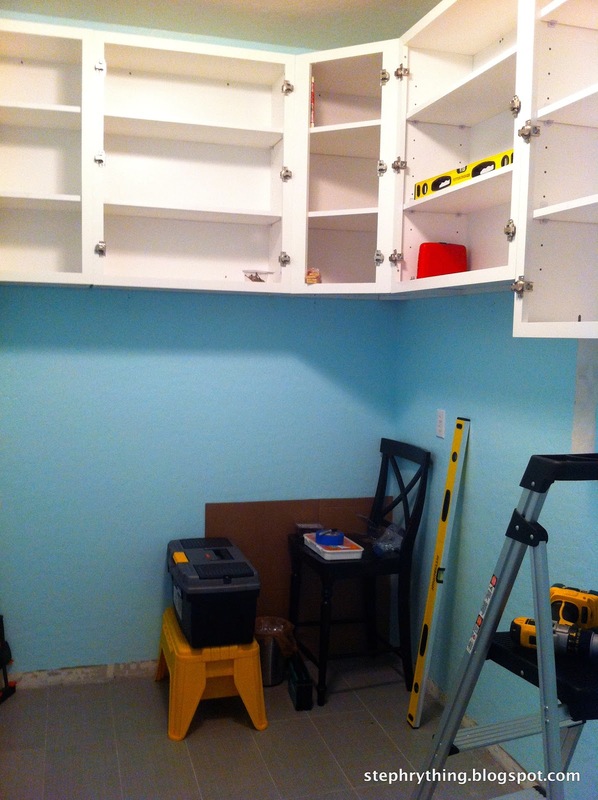 and I stored some craft boxes on a tiered shelf and spare cabinet (picture taken pre-paint). Nice. For a few months we just let the room sit. But we knew the room had way more potential, despite its small size. 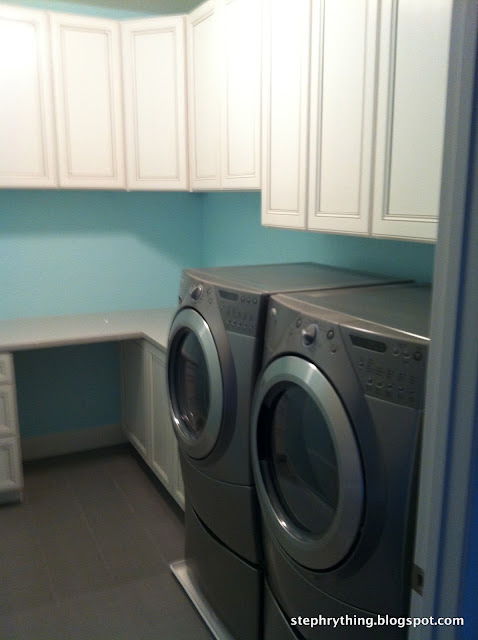 We tossed around the idea of cabinets and a countertop to utilize wall space and high ceilings. We priced out configurations through cabinet companies but weren't sold on their products or prices. Brent was a stud and researched cabinet options for me at local stores and online. 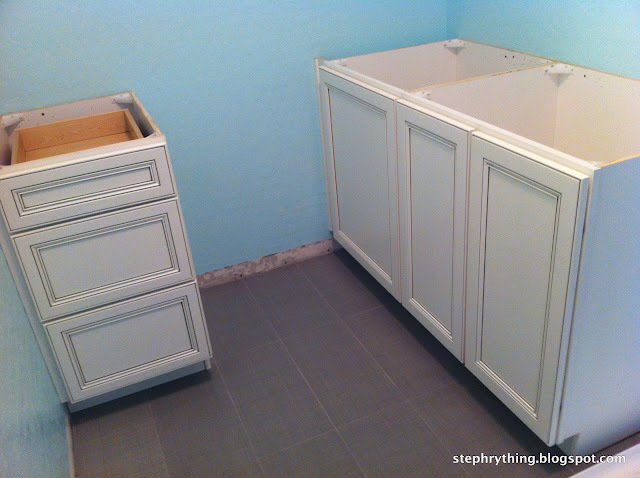 After much consideration and planning, I chose my cabinets and he ordered them online -- saving us lots of cash! The cabinets shipped a few weeks later and Brent went straight to work. The uppers went up in a jiffy since they were delivered pre-assembled. Brent is pretty handy with a ledger board and drill. 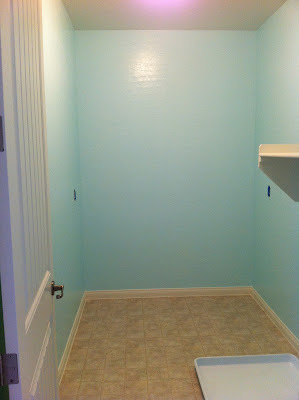 Oh yeah, we also said goodbye to the ugly linoleum. By shopping around we bought this 10x20 gray linen tile for $2.89 sq ft, which was a dollar cheaper per sq ft compared to other stores -- which adds up! Since Brent was juggling several other projects, we had a guy install it for us in the bathrooms and laundry room. 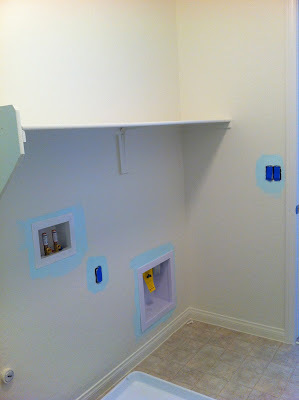 Once the uppers were in, the base cabinets came next. Lookin good, eh? These are Cardell Classic II Flat Panel Maple cabinets in white with pewter glaze. I absolutely love how they have the look of antiqued white cabinets, yet with a modern twist using flat panels and pewter glaze accenting. It fits right in with our modern style. Then the countertops arrived! 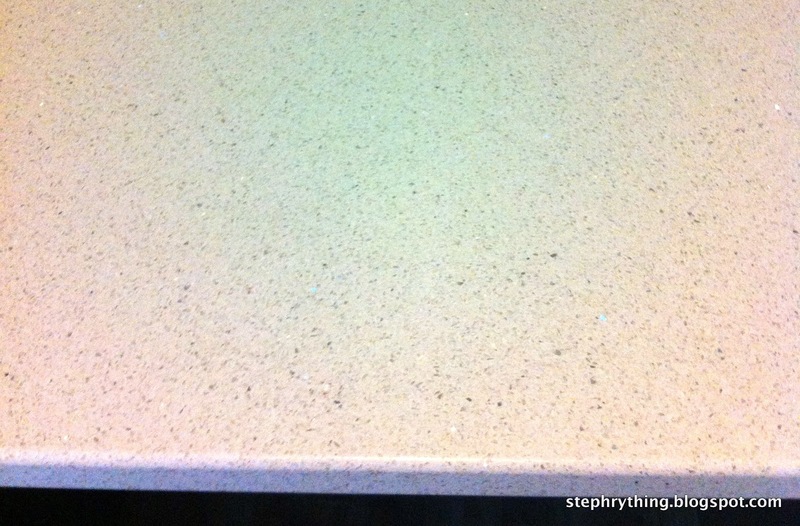 This is Silestone (quartz) Stellar Snow. It literally sparkles. 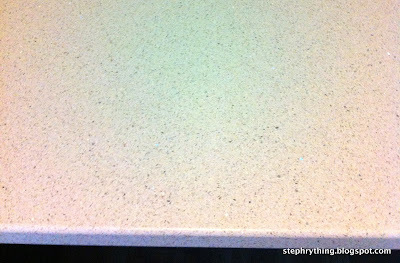 Because the amount of quartz we needed was less than an entire slab, we ordered it through Home Depot, who charges by sq ft instead of making you buy an entire slab -- saving more cash! 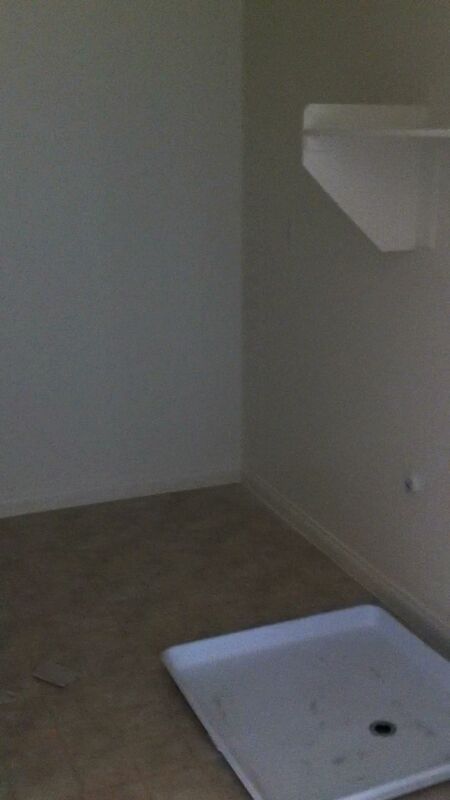 The guys who installed our baseboards downstairs (a few months back) returned to outfit the upstairs, too. The finished product! Three drawers on the left base cabinets, three big base cabinets on the right. Nine upper cabinets. Space for me to sit and do crafts. And still enough room for the washer and dryer. All within 6' x 10'. I am beyond thrilled to have my own little mom cave. Maybe I'll even add a chandelier. It looks awesome! I LOVE the cabinets!